Robert Henri, under the guidance of Denman Ross, experiments with a substitute for the pigment white. The lightener advances the color and temperature of the light source with less neutralization, maintaining a greater sense of luminosity. 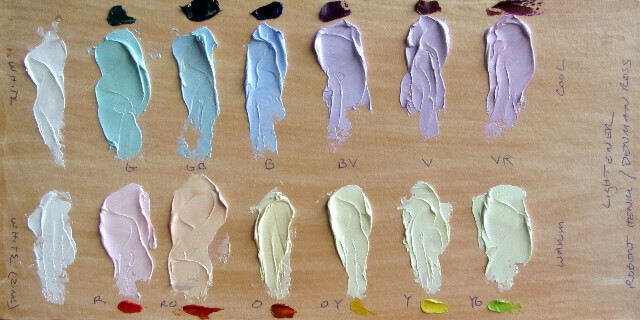 One would find it difficult to use a palette without the pigment white. Most times its conceived of as a way to increase the value of the color one is working with. This is true, but one also needs to take into account what one is using to increase the value. White is a neutralizer. Color gives the sensation of light to a greater degree than value. One must account for value but raising the value exclusively with white neutralizes and dulls the intensity of the light source. In one of my past blogs, I spoke about something Robert Henri referred to as the super color. The super color is that color that is a part of every object in one’s field of vision. It envelopes and surrounds that object and the very atmosphere in which the object is placed. It is like viewing the landscape as the sun is setting. The trees, grass and hills all contain an aspect of that setting sun. The orange or red glow tells us quite distinctly that this is the end of the day. But this does not only exist outside in the landscape but in the studio as well. One needs to account for the color of one’s light source. Is it north light? Is the source the dome of the sky? Is it an electric bulb and if so what kind- halogen or incandescent? Is there further infiltration into this light source from the trees outside or from the ceiling or walls? And when one examines the source, is that source cool or warm? What color is it? This is the most difficult question but integral to one’s ability to even begin to paint what is before you. As an example: In the studios of the Woodstock School of Art where I teach, the source of illumination comes from north light windows. In the summer, on most days when the sky is blue- my light source is cool and blue to blue/ violet. When there are clouds in the sky, the source is more toward the violet. But in the summer, I also need to account for some reflected light the studio receives from the trees outside and in such cases I need to add some green (without neutralizing the color). In the winter, when the sun is lower in the sky and there is a lot less light available, I find the color is warmer and less distinct. Robert Henri began playing with this idea of a substitute for white in 1914- early 1915 after his meeting with Denman Ross, a color theorist from Harvard University. Ross’s book, The Painter’s Palette, greatly influenced Henri in many ways. He experimented with Ross’s Hot/Cold palettes and his use of a contrasting scale of values. And later, he integrated these ideas into the spectrum palette developed by H.G. Marratta ( Ross, himself, recommends the spectrum palette as a valuable tool similar to his own Hot/Cold palette). But one thing remained throughout his life, even into his final work- and that was the importance of the lightener (Ross). All of Henri’s paintings after 1914 use a lightener. Ross’s method for setting the lightener was to have both a cool lightener and a warm lightener. The cool lightener was used in the areas where the light side of the object or figure was cool-to raise the value of color in those areas. And opposed to this, the warm lightener was used on the warm shadow side to lighten those values. If the light source was warm, then the lightener was reversed with the warm lightener used on the illuminated side. Ross’s system was very rational and logical but was not always so convienent to use. Much of it took great effort and diligence to stick to the confines of the palette and maintain its inherent structure. Henri would later keep one lightener only- and that being the color of the light source. Mixing the lightener: This is a substitute for pure white; As white is a neutralizer; The lightener identifies the color of the source of the light and acts as a super color. One can divide the palette between those colors that are warm and those that are cool. The cool end of the spectrum would be: G ,GB, B, BV, V, VR. And the warm end of the spectrum would be: R, RO, O, OY, Y, YG. The Cool lightener is to be used when the light source is cool-ie north light. Some possible combinations: Violet + White; Blue Violet + White; Blue + White; Green+White ( care must be taken that this does not neutralize the flesh tone) etc. The Warm lightener is to be used when the light source is warm- ie electric light. Some possible combinations: Yellow + White; Orange + White; Red + White etc. Mixing a lightener is the process of choosing a color + white that reflects the color and temperature of the light source. Above, I have given just some of the possibilities. These may seem simplistic, but it is important to remember that with each addition of the lightener, one is reinforcing the color and temperature of the light source. White, itself does not do this. The lightener maintains the integrity of color ( and therefore luminosity) and temperature with every paint stroke. Judith, At your suggestion I have been using a lightener for some time now. At first I wasn’t adding enough color to the white but corrected that again at your suggestion. Using the lightener has caused my paintings to have a much greater sense of light and color. I use it all the time now and would not go without it. I like your examples of different lighteners at the top of the page it s a very nice thing to have to refer to.